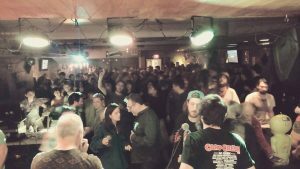 Thanks to all who came down to join us at our sold-out show 11/18/16 at Pacific Standard Tavern – New Haven. Apologies to those turned away at the door – it was an enthusiastic turnout that exceeded the capacity of the venue! As always, hats off to Adam for this acoustically wonderful space and its state-of-the-art sound system. We cannot thank enough our close friend Dan “Case of Space”Howard for his photonic expertise at elevating and energizing the scene with his incredible Liquid Light Show. We are psyched to keep the momentum going tomorrow appearing with Shakedown in Watertown at The Red Door.